Do you have a coatcheck? Yes, we have two coatchecks located in the basement as well as upstairs in Lilly's Pad. Is this dance party strictly for college kids? In order to gain admittance into the club, you need to have a college ID or be in the same party as someone who has a college ID. Yes, we do. Fill out a form on the contact page, or call the club during business hours 11am-6pm Monday-Friday at 203-624-TOAD #0. What hours does the dance party run? College dance parties are hosted Saturday nights from 8:30PM until 1:50AM. 18 with a college ID and 19 without. Dress to impress - neat attire. No Timberlands, no chains, no hats. Take exit 47 (Downtown New Haven Exit) this puts you on a four lane highway. Follow this to the last ramp. At first light take a right onto York Street. 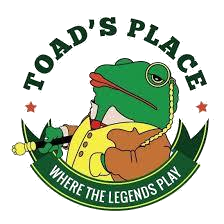 Toads is 4.5 blocks down on your lefthand side--300 York Street. Exit 1 (Downtown New Haven Exit) then the same as above. Route 8 to route 63. This turns into Whalley Ave. Follow Whalley to downtown area. Take a left onto York Street. Toads is about 1/2 way down the block. 69 turns into Whalley Avenue and then follow directions above. From I84 take exit 11 which is Route 34 and head towards New Haven. Route 34 merges into George Street. Follow George to the downtown area. Take a left onto York Street. Exit 59. Take a right at the end of the ramp. At next light make a left onto Whalley Avenue. Go towards downtown and when you past the Holiday Inn (on the right) take your next left onto York Street. We are 1/2 way down the block on the left. Click Here To Buy Official Toad's Merch!